Hall's Mint Tower marks the mint that once made this sleepy town mighty. 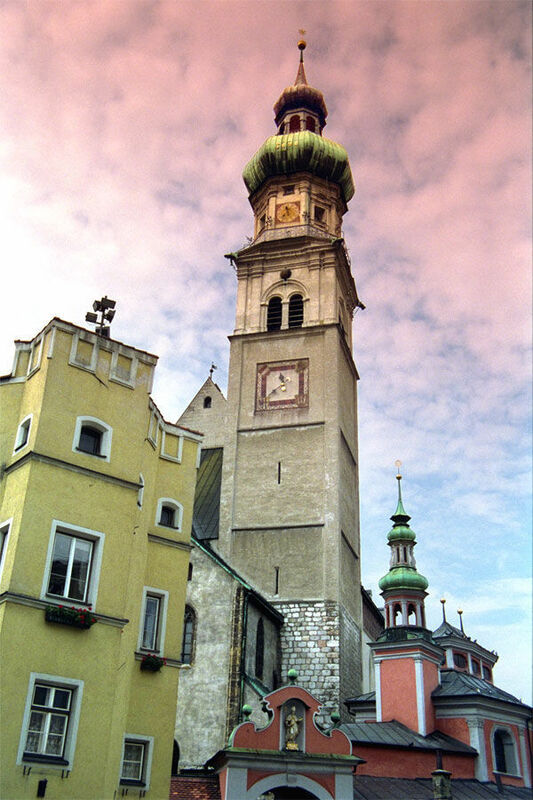 The Tirolean-Baroque steeple of Hall's church overlooks a rich bundle of pastel-hued medieval buildings. It's a brisk mountain morning in the Tirolean town of Hall. Merchants in aprons hustle, and roses, peppers, and pears fill their tidy street-side stalls, competing for my photograph. There's not a tourist in sight. They're all five miles up the river, in Innsbruck. Just as Hallstatt is the small-town escape from Salzburg, Hall is the place to go if you want the natural surroundings of Innsbruck without the big city. Vagabuddies, who enjoy the cheap accommodations in Innsbruck, do Hall as a day trip. 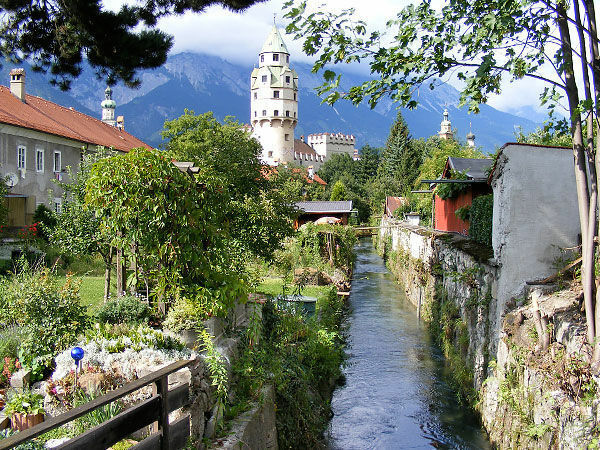 Hall was a rich salt-mining center when Innsbruck was just a humble bridge (Brücke) town on the Inn River. Sprawling Innsbruck's tourist industry crowds into its tiny medieval town center. Hall, a diminutive village in comparison, actually has a bigger old center. Its rich bundle of pastel buildings and cobbled streets feels refreshingly real — too real if you're trying to accomplish anything more than a leisurely lunch between noon and 2:00 p.m., when everything closes. The tourist office often organizes one-hour walking tours in English. 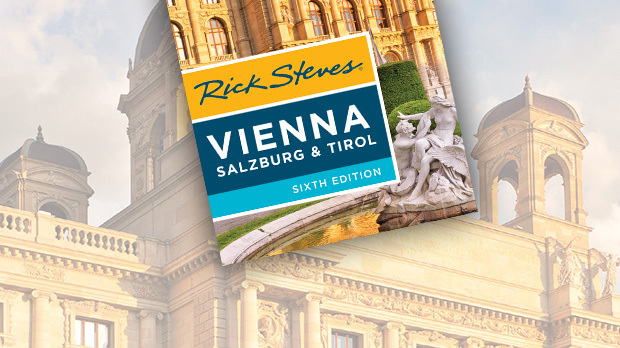 The luxurious Tirolean Baroque church, the elegant architecture lining the streets, and 500-year-old mint combine to make it clear that in its day, Hall was a local powerhouse. Back when salt was money, Hall was loaded. You can tour salt mines near Hall in places like Hallein and Hallstatt ("Hall" was an ancient Germanic word for salt). Salt mine tours are fun, but can be expensive and be crowded with long lines. While they are the major reason to go through a turnstile in this area, I find them only marginally worth the money, time, and trouble. Hall has a quicker, cheaper, and easier alternative: its Mining Museum. Tours are given of the town's reconstructed salt mine, complete with pits, shafts, drills, tools, and — the climax of any salt mine tour — the slippery wooden slide. It feels like a real mine. Give your trip a memorable splash by spending a sunny afternoon at Hall's magnificent Freischwimmbad. This huge outdoor swimming pool has four diving boards, a giant lap pool, a big slide, and a kiddie pool bigger than anything in my hometown, bordered by a lush garden, a sauna, a minigolf course, and lounging locals. The same mountains that put Innsbruck on the vacation map surround Hall. For a lazy look at life in the high Alps, drive up to 5,000-foot Hinterhornalm and walk to a remote working farm. Begin your ascent in Gnadenwald, a chalet-filled village sandwiched between Hall and its Alps. Pay the toll, pick up a brochure, then corkscrew your way up the mountain. Marveling at the crazy amount of energy put into such a remote road project, you'll finally end up at the rustic Hinterhornalm restaurant (often closed). Hinterhornalm is a hang-gliding springboard. On good days, it's a butterfly nest. From there, it's a level 20-minute walk to Walderalm, a cluster of three dairy farms with 70 cows that share their meadow with the clouds. The cows ramble along ridge-top lanes surrounded by cut-glass peaks. The ladies of the farms serve soup, sandwiches, and drinks (very fresh milk in the afternoon) on rough plank tables. Below you spreads the Inn River Valley and, in the distance, tourist-filled Innsbruck.